Boy Scouts start a fire during the 25th annual Chill-Out at Camp Roosevelt in East Eddington, held Feb. 20-22. Boy Scout Joshua Turlo reads a book inside the snow shelter he made during the 25th annual Chill-Out at Camp Roosevelt in East Eddington, held Feb. 20-22. Boy Scout Joshua Leonard works on his shelter during the 25th annual Chill-Out at Camp Roosevelt in East Eddington, held Feb. 20-22. An Eagle Scout set up a table to teach younger Scouts about how to make home-made snowshoes during the 25th annual Chill-Out at Camp Roosevelt in East Eddington, held Feb. 20-22. EDDINGTON, Maine — A year after three Boy Scouts took a wrong turn and got stuck on a sheer cliff while hiking Blackcap Mountain, requiring assistance from the Maine Warden Service and local firefighters, youngsters in the Katahdin Area Council received winter survival training. “They’ll never forget the experience from last year, and they’ll never forget what they learned this year,” Scout leader Tom Turlo said this week, referring to the 25th annual Chill-Out held Feb. 20-22 at Camp Roosevelt in East Eddington. 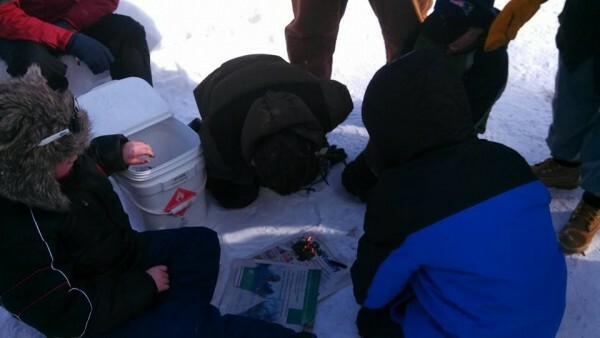 Two of the four Scouts who set out on the ill-fated winter hike during last year’s Chill-Out returned to camp this year, where about 300 Scouts and Cub Scouts played in the snow, threw tomahawks and went ice fishing. The approximately 150 older Boy Scouts who attended got to put their winter survival skills to the test by making winter shelters, building fires, dealing with injured people and signaling for help, all with minimal supplies. “Nobody got lost. 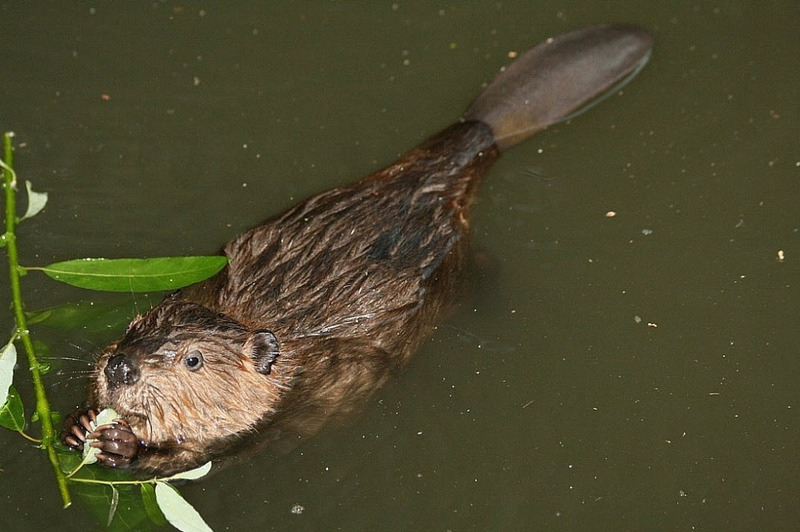 They got stuck,” Turlo said of last year’s rescue, where he and another Scout leader went and found the stranded teenage boys after a fourth Scout returned and told them of the predicament. When they realized the rock surface was so sheer they couldn’t reach the boys, they called 911. Six game wardens and firefighters from Holden and Eddington, as well as search and rescue personnel from Mount Desert Island and Jon Tierney of Acadia Mountain Guides used ropes to get down to and rescue the three stranded Scouts, who were cold but otherwise unhurt. To learn from last year’s experiences, Turlo created challenges designed to test the Scouts’ ability to survive while out in the elements. Instead of pitting one group of Scouts against another, the decision was made to make each challenge an individual one. “I really wanted to tax their brains,” Turlo said. At each challenge, the Scouts were given options. For example, when they got to the shelter building area, they could choose from four different building materials. “We gave them the option of a shovel so they could make a snow shelter, a pancho and pieces of paracord, wood or pallets,” Turlo said. Some of the Scouts who made snow shelters slept in them during the weekend gathering, he said. Temperatures were in the teens during the day and as low as 4 degrees below zero during the overnights, according to the National Weather Service. During the fire-starting session, the Scouts were given a bucket full of random items and they had to choose which could start a flame. The signaling part of the challenge featured whistles, while mirrors and fires were used to attract the attention of passing aircraft. “Three long whistle blows is the signal for help and a triangle of three fires is the international sign of distress,” Turlo said. When it came time for the triage challenge, the Scouts had to build a stretcher to carry an injured person, but they also got points for treating the patient with compassion. 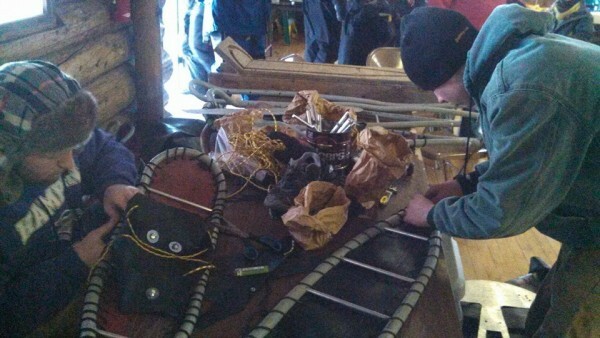 Inside the clubhouse, Cub Scouts could braid their own rope survival bracelets or learn from an Eagle Scout about how to make their own snowshoes. Members of the Maine Army National Guard, Maine State Police and Maine Warden Service were on hand to give demonstrations and answer questions. “Everything went off without a hitch,” Turlo said of the two-day event.